As an author, there is nothing more exciting than hearing your work come to life, especially when there are talented voice actors like Kristin James (as Evie), Eric Stuart (as Butch), and Brad Oxnam (as Sebastian) involved. This amazing group of voices gave life to some of my favorite characters in The Hanging Tree audio book, which is now available on Amazon and iTunes. If you follow my blog, you’ll remember Kristin, who previously voiced Daddy Darkest. In our 2018 interview, she gave us a glimpse into her life as a voice actor and her side gig as a dog agility trainer. To celebrate the release of The Hanging Tree, I chatted with Eric Stuart, a voice phenom with a wide repertoire, having successfully combined the worlds of music, voice acting, and directing for many years. He has voiced beloved characters in shows like Pokémon and Yu-Gi-Oh! and has been featured in commercials for Priceline, Pizza Hut, Dunkin’ Donuts, and Home Depot, just to name a few. Even more impressive, Eric has his own band, The Eric Stuart Band, and has toured with rock legends like Peter Frampton, Ringo Starr, Lynyrd Skynyrd, Chicago, Hall & Oates, and many, many more. Today, I’m sharing an interview with Eric and a snippet from the just released audio book for The Hanging Tree. 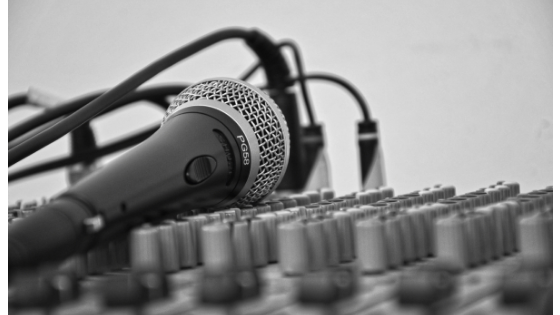 Tell us about your path to becoming a voice actor. The short version is I was a musician first, and I was offered a job in a recording studio when I was 18 years old. I thought they did music. Turns out they primarily cast and produced radio and TV voice overs. As time went on, I learned by directing and then jumped in the booth to fill in here and there until the clients started picking me for the actually spots. The timing was perfect as I was about to go on tour and having a day job wouldn’t work. Voice acting allowed me the freedom that I wanted and also, I really enjoyed acting ‘anonymously’ so that I could still be on stage and not be recognized as the Tidy Bowl Man singing rock songs. You wear so many hats—singer, voice actor, director. Which role do you find the most fulfilling? Some of my voice acting fans may not like this answer but being a singer/songwriter is who I am. Directing and voice acting are my ‘job.’ I love all of it, but to give you a simple example, I can take a trip and not think about voice acting. I can’t go away without bringing my guitar. The voice acting and directing have given me the freedom to play music and for that, they are very intertwined. You have your own band, the aptly named Eric Stuart Band, and have toured with rock legends like Peter Frampton, Ringo Starr, Lynyrd Skynyrd, Chicago, Hall & Oates, and many, many more. That is amazing! Tell me about some of your favorite experiences touring. You have voiced beloved characters in popular shows like Pokémon and Yu-Gi-Oh. Who’s been your favorite character to voice? Oh, I can’t pick one. They are my children! There are three main ones that I feel very fond of voicing. Brock and James from Pokémon and Kaiba from Yu-Gi-Oh! Brock is a good friend. Distracted by girls a bit, but he is always someone you can depend on, and it is nice to play a character that has a good moral compass even with comedy. James, the comedic villain in Pokémon, gives me a chance to be very campy and also channel my inner Fraiser and Tim Curry. His flamboyant attitude makes him a blast to play. Funny bad guys are always the best. Kaiba is the most complicated one. He is a rival, not a villain. His job is to push our hero to stay at the top of his game. This is a fine line that I work hard not to cross. He has redeeming qualities but can also be a sarcastic jerk with fantastically biting insults. You either hate him or want to be him. In your work on The Hanging Tree, you perfectly captured the essence of Butch Calder—an ex-con with a heart of gold. How do you get into character and prepare for a recording session? Thank you so much for the compliment and the opportunity to play Butch. Honestly, I don’t like to over think a role or get bogged down in the minutia. I like to get direction from the client/author as an overall vibe. If a book is well written, like this was, it makes the flow very organic. I have had to do many characters, dialects, impersonations, in many audiobooks. Butch was easy to figure out, though I am not an ex-con (lol). I feel we all are a bit damaged. Some of us deny it, while others admit it and understand it is part of who we are. Not proud but not trying to white wash it. Plus, like Butch, I am a big KISS fan. I have been doing a lot of industrial/training courses for a major car company which is actually fun. I get to bring life to what could be very dry copy. I am also producing an original series starring some of my well-known cartoon voice actor pals. It is an illustrated audio drama (which we coined), which is like listening to an audio book while reading a comic. No ‘animation’ but more like a moving storyboard with all the focus being on the script and the voice acting. I am also finishing up a few new songs in the studio. My band will be releasing a new single in the next month or two. I also do a lot of traveling to anime comic cons as a guest. It gives me chance to meet the fans and see some amazing places. I am going back to Australia in June, Germany in July, and England in August. An incredible bonus to making funny voices in cartoons. What do you do when you’re not in the recording booth? Not in the booth? Is that a thing? If I didn’t have my dog, Jet, I probably wouldn’t leave the studio very much. I like to do home improvement projects, ride my bike (when it is warm), and I am also a big gamer and movie guy. My world is pretty much audio focused, so even my down time has something to do with the entertainment industry. That being said, living here in Nashville rather than being in New York has allowed me to slow down and smell the flowers a bit while still getting things done. I don’t feel like my work overwhelms me. It is just part of who I am.